I don’t really have anything poetically “New Year” to blog about right now, so I figure I might as well muse about some pretty good music I like a whole lot. When I saw the first episode of the anime Fairy Tail, I loved it. Part of why I liked it, and why I’ve loved the entire series so much that it has become my #1 Favorite, is the music! The soundtrack was composed by Yasuharu Takanashi (and I probably butchered that name somehow) and this work is really good! Now, of course, this is just my opinion, but my opinion rocks, in my opinion. 😉 Say that five times fast! The main theme of Fairy Tail sets itself apart immediately in at least one aspect: it has a Celtic texture. It’s Celtic rock-ish, mind you, but Celtic. Anime does not get a lot of Celtic-themed music in its multitude of soundtracks. So it’s distinct, and I love Celtic music anyway, so I enjoy it quite a bit! Even more, each version of this main theme has a different flavor. Some are, I admit, quite similar, but there is a good deal of difference, too. The “slow” version, for instance, isn’t just a slowed-down playing of the same notes with the same instruments. They follow the same overall melodies, like a pair of relatives resembles each other, but the one is pure action, and the other is a mixture of grief, relief, hope, and triumph. It occurs to me that one can broadly put every version of the main theme into one of those two camps: either jump and holler Action, or soft, stirring Bittersweet Triumph. (ok, that second category may need a better name…) If that seems to trivialize it, it does not. There’s that much nuance between the several versions of the theme that each one, however similar to others, has its own unique flavor and texture. And, heck, there is more than one version which bridges the gap and manages to be both Action and bring tears to your eyes. To have one composer do this with one piece of music is pretty rare, I believe. And all that is just about the main theme! There are also “character themes” built around something specific about the character and their usual mood. When they want a scene to have that mood to it, they use the music. Lucy’s theme (is that an accordion I hear?) is bubbly and upbeat, just enjoying life. Gray’s theme leans toward rock and heavy metal, nodding towards his intensity and the cold ice magic he uses. Natsu’s theme is straight-up a piece of action music, as he’s one of those walking incarnations of destruction, or at least of collateral damage. Erza’s first theme is gripping, full of action and power, but with a certain feminine element to it, thanks to the vocalizations. She is a very strong woman, after all. The theme introduced as we learn her tragic backstory is haunting and heartbreaking. And when we see her battling the worst monsters, including her own doppelganger, and still standing strong, there is a Dracula-ish texture, and it’s not always clear who the “monster” is, LOL. There are even themes, of sorts, for two of the legendary, overarching figures of the series. “Zeref’s Melancholy” is soft and sad, but carries a hint of the absolute danger posed by this insane and powerful wizard of darkness. “Mavis’ Grave” is somehow soft, yet strong, with low notes, tonal bells, that triangle instrument, vocalizations, etc. It’s majestic, like they were thinking, “This is what it would feel like to catch a glimpse of the gates of Heaven.” That we are introduced to these two figures in fairly close succession, and that they have a history together, is not surprising, as both of their themes use the feather instead of the hammer to convey who these two powerful figures are. And all of these are just the pieces which can be tied to specific characters! 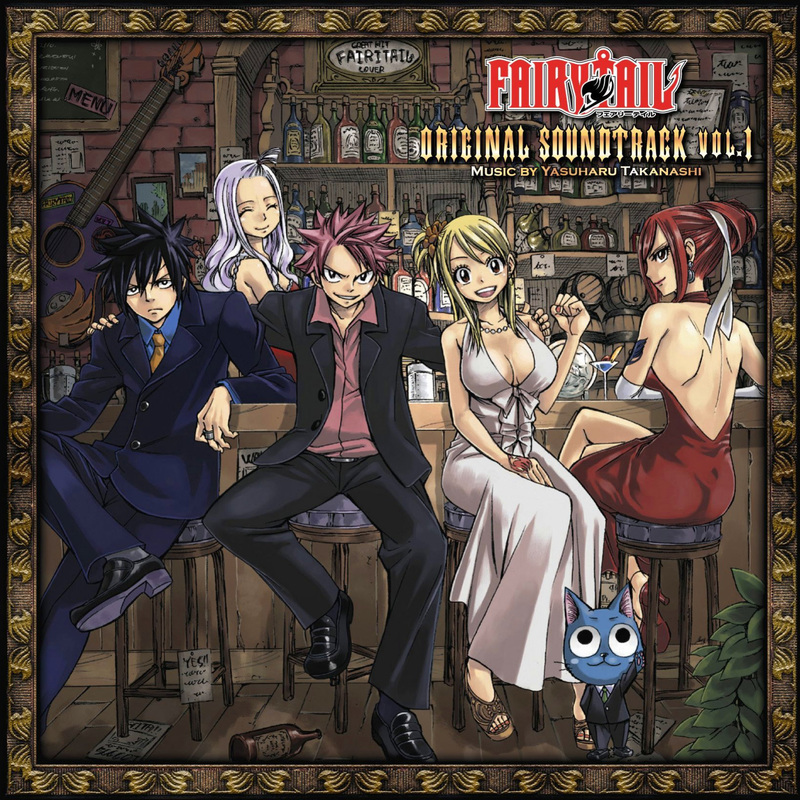 With something in the neighborhood of one hundred and fifty published tracks, the Fairy Tail Soundtrack is certainly not lacking in material, and it provides a rich, full body for the audience to enjoy the story it surrounds. Whether it be the epic clash of powers set to “Last Magic,” the overwhelming awe of “Fairy Law,” the otherworldly power of “Celestial Spirit King,” (I noticed that it resembled a theme found elsewhere in the series for a monster of immense power and destruction) the steadfast friendship of “Bonds,” or a hundred other feelings, the music is all a masterpiece! And definitely part of why Fairy Tail is my favorite! This entry was posted in Anime and Cartoons, Muse-ings and tagged Fairy Tail, Fairy Tail Soundtrack. Bookmark the permalink.